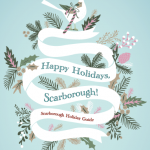 Welcome to the HOLIDAY GUIDE for Scarborough, brought to you by the Scarborough Community Chamber of Commerce, SEDCO and Scarborough Buy Local. The Guide is in a PDFs format and meant to be updated. If you would like to include your holiday events, specials, discounts or gift ideas in the Scarborough guide, please send the text information and photos to research@sedcomaine.com.